I was recently issued a new computer at my job. The one it replaced was a hand-me-down from someone more senior than me, and I’d had it for almost five years, so it was a bit of an antique. The new machine is brand new. It is also noticeably slower than the old one. Not only is the machine slow, but its mouse is poorly designed. Left-click is a tiny portion in the corner, right-click is approximately 99.99999999% of the surface. It’s like the Cosmic Calendar in Carl Sagan’s Cosmos, where the whole of human history is an infinitesimal square at the end representing the last couple of seconds before midnight on the night of 31 December. So it’s frustrating to have to use the thing. I find myself doing a lot more work at home now so that I don’t have to fight with it. Anyway, one day I left my office to eat lunch in a food court across the street. The only thing that looked edible was an egg salad sandwich. It cost $4.50, showing a poor grasp of the concept of an egg salad sandwich, the whole point of which is its inexpensiveness, but I was too hungry not to get anything. So I bought the sandwich and sat down at one of the tables. An old friend of mine showed up and sat with me. By this point, I had discovered that the sandwich was not only inappropriately priced, but was disgusting. The egg salad included fresh onions, creating the illusion that the eggs were rotten. It was a struggle to eat, but by the time I made that discovery I was no less hungry and much less wealthy than I had been when I decided to buy the sandwich, so I was stuck with trying to eat the accursed thing. We started chatting. I told him about the sandwich’s price and disgustingness. He works as member of the university’s staff, in a position where a wide variety of researchers tell him about their work, so he always has something interesting to say. He told me that the price of the sandwich might very well reflect a change in the way foodstuffs are priced, a change that is connected in some way to global warming which is in fact an even worse problem than is generally realized. He began explaining, further, that the idea of mixing fresh onions with egg may be connected to the collapse of production in other crops that are traditional in egg salad, but that was so depressing we quickly changed the subject. I mentioned the weird slowness of my new computer. He explained that computer hardware makers have now reached the limits of Moore’s Law, while software makers keep adding new functions, so that we can expect computers in general to get slower, not faster, for the foreseeable future. The awkward mouse is apparently the consequence of some other ineluctable trend in the decline of the technological age. This was getting too grim. I made some remark about what a sunny day it was; that brought him back to global warming, which by the way is acidifying the oceans and triggering a mass extinction event that may yet be the greatest in the earth’s history. I mentioned something about packing my lunch in the future, to avoid inedible food and save money. The reference to saving money reminded him of a researcher who had told him about his findings that people our age (we’re now in our mid-40s) are far more likely than were people in days gone by to spend their retirement years living on the street. By now I had choked down that entire sandwich. A supremely gloomy conversation was just the thing to take my mind off its loathsomeness. I wanted to close our conversation with something that would not lead him to share depressing information, but couldn’t think of anything. He excused himself, saying he had a meeting in a few minutes. We left it there. Andrew Gelman writes a fine blog, but he shares the bizarre fixation on instrumental voting that clouds the thinking of so many in the USA. He keeps regurgitating a pained argument, based on the idea that voters are like buyers of lottery tickets. The voter wins the lottery if s/he casts the decisive vote in the election. Since Professor Gelman trots this out to discuss US presidential elections, in which over 100,000,000 votes are cast, he can apply this argument only by resorting to extremely unlikely scenarios. So, he calculates the likelihood that Oklahoma will be decided by a single vote and that Oklahoma’s Electoral Votes will be decisive as 1 in 1 billion. If the better of the two leading candidates adds a cumulative $30,000,000,000 of value to the lives of the world’s people beyond what the worse candidate adds, or subtracts that much less value, then each of the popular votes for president cast in Oklahoma is like a ticket that would be valued at $30 in a fair lottery. Washington state Democratic elector Robert Satiacum has said that he will not vote for Hillary Clinton; if, as is overwhelmingly likely, Washington state votes for the Democratic candidate, let’s say Mr Satiacum has a 50% chance of voting for Dr Stein, a candidate who fits his views quite well. Now, the parties choose electors who are reliable supporters of the party’s regular candidates; Hillary Clinton is very much a regular Democratic candidate of the variety that has been on the market for the last quarter century, while Don-John of Astoria is markedly different from the usual run of Republican nominees. So if there is one faithless Democratic elector, it is likely that there is more than one faithless Republican elector. It seems unlikely that there is much more than 1 chance in 10, in the scenario as we have constructed it so far, that Mr Satiacum’s vote would be sufficient to qualify Dr Stein as one of the top three Electoral Vote recipients, the group from among whom the US House of Representatives must choose the winner of an inclusive election. So that gets us to a 1/1000 chance that the House will be presented with a vote of Trump 269- Clinton 268- Stein 1. 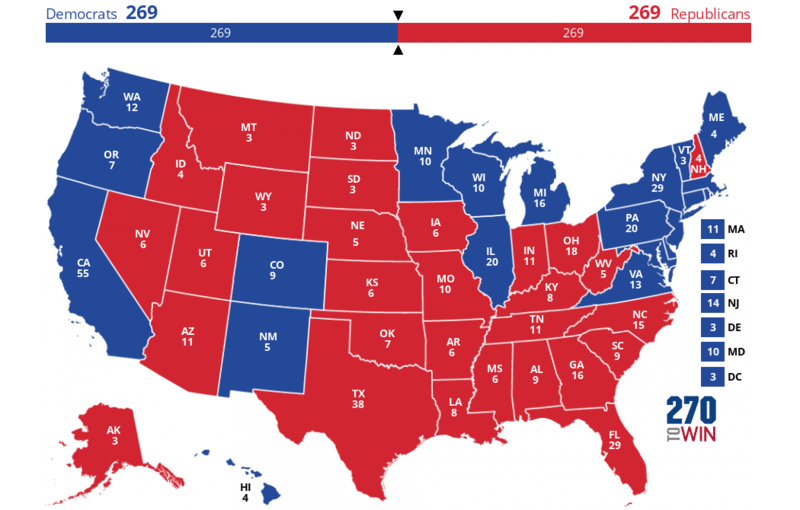 If the Democratic presidential candidate fails to win a clear victory, it is unlikely that the Democrats will gain enough seats in the House to defeat Don John. Let’s set that likelihood at 1/1000 also. That gets us to 1/1,000,000. Hillary Clinton is a mortal being, subject to all the frailties flesh is heir to. In the interval between the Electoral College vote and the congressional vote, she may fall gravely ill, or be abducted by aliens, or have a religious awakening and decide to devote the remainder of her life to Hare Krishna, or otherwise become unavailable. Let’s set the odds of some such development at 1/1000. Little as they may love Dr Stein or the Greens, the Democrats could hardly vote to install Don John as president. That gives us our 1/1,000,000,000 chance of a Stein presidency. Absurd? Of course. The absurdity level starts far above 1/1,000,000,000; even the 1/ 1000 long-shots are not worth a thought. As I’ve said before, instrumental voting of the kind Professor Gelman treats as the only worthwhile kind is reasonable only in electorates of fewer than 700. Expressive voting, however, has value even in very large electorates, and there is no lottery about it. Office holders seeking reelection and other leaders of major parties do in fact look at election returns in search of votes they could gain or lose depending on what policies they support; votes cast for minor parties with clear issue profiles are among the inputs which provide them with this information. When the major parties become too much alike, this is the only way voters can signal a desire for them to move apart, as voters signal when they believe the parties have become too different from each other by switching from one major party to the other. So, the only rational vote you can cast is a vote for the candidate who best reflects your views, whether that candidate is supported by a major party or a minor one. What would happen if the US presidency were replaced by a plural executive? I’ve long advocated replacing the US presidency with a plural executive. I think that in the long run, that would drain several poisons from American political culture. Where a single person is the focus of so much attention, the tendency to believe that the power to solve the world’s problems is in the hands of that person becomes very strong. Supporters of the political party led by a president or candidate for president then come to believe that if the president were unhindered by the restraints of the law, of political opposition, and of morality, evil and hardship would vanish from the earth. Magical thinking of this sort leads to support for wars, disregard for civil liberties, tolerance for secrecy, and other measures that have consistently produced disastrous results throughout history. Meanwhile, supporters of the other party come to believe that it is the personal wickedness of its presidential choice that threatens the earth with the greatest woes, and under that belief lose all contact with political reality, showing ever more fanatical support for their party and its candidate regardless of the facts. Replacing the presidency with a plural executive would eliminate the glamour and mystique that attach to the office of the chief executive, thereby allowing the clouds of magical thinking to dissipate and creating the possibility that a modicum of rationality might make itself felt in US political life. Perhaps voters would even start to participate in elections for the most powerful bodies in all of American government, the state legislatures. Such a rise of rationality would take time, however. In the first generation, the plural executive would probably compose a more-or-less representative sample of the existing political elite, and would organize itself around the consensus views in Washington. Of course, a country which had just managed to rid itself of the presidency and to put a plural executive in its place would probably be a saner place than is the celebrity-obsessed, war-mad USA of the early twenty-first century, and so the Washington consensus in that scenario would be quite different from the consensus that exists today. However, it is worth pausing over the thought that, if we did have a plural executive in the USA, that executive would probably be a lagging indicator of prevailing opinion in Washington conventional wisdom, since that description also fits Hillary Rodham Clinton. Indeed, for all her undoubted talents, experience, and work ethic, as a policy-maker HRC could easily be replaced by a software program which would distill the policy recommendations of the leading op-ed pages, think-tanks, etc. Next year, then, we are likely to have a sort of dry run of the workings of a plural executive, though in an environment still driven by delusions about a superhuman god-emperor.